Condition of Artwork: Please note this artwork is retained within its original frame; consequently we have not closely examined the work but we note obvious imperfections below. Therefore, we recommend you visit the Gallery to satisfy youself that its condition is acceptable to you. Please inspect the image carefully. Some general wear and marks to the framing and/or matting. 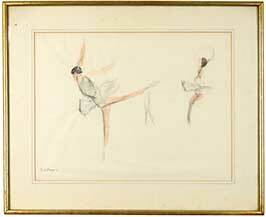 Notes: Henley' is an original watercolour by Paul Lucien MAZE. This framed piece measures 45.5 x 33.5cm and was completed by the listed and well loved artist at Henley-on-Thames in Oxfordshire. Signed and titled by Paul MAZE in the lower right corner. Please note this artwork is retained in its 'original frame' and we cannot comment on the condition of the work within the framing. Some general wear and marks to the framing and/or matting may be evident. Please inspect the image carefully.